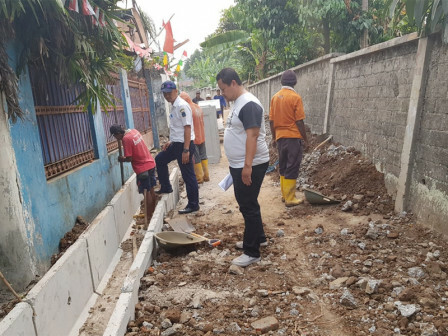 Jalan Kober that is located on Jalan Kober in Tengah Urban Village, Kramat Jati, East Jakarta is concreted and has reached 60 percent.
" We do repair by means of concrete. Thus it can be more durable and not easily damaged during the rainy season"
East Jakarta Bina Marga Sub-dept. Maintenance Section Head, Benediktus Stimorang stated that if it uses hotmix asphalt, the road will quickly damage. Because it is very prone to inundation, especially in the basin area. "We do repair by means of concrete. Thus it can be more durable and not easily damaged during the rainy season," he expressed, Wednesday (8/29). According to him, the road has 252 meters length with 3.6 meters width. "This has been carried out since early August and is targeted to be finished in the upcoming October," he stated.